They teach you in creative writing programs not to write about writing, because writing about writing, and writing about writer’s block especially, is inherently boring, the acme of navel-gazing. (Here’s holding out hope for writing about writing about writer’s block.) But Nick Cave didn’t go to creative writing school, which explains away some of his bad habits. “There She Goes, My Beautiful World,” from 2004’s Abattoir Blues, is an enacted demand for inspiration badgered up from Cave to his muse. That handful of plants he tosses out at the song’s beginning, along with a slight compliment (“All the words you said to me/Still vibrating in the air”) form faint praise, masking the tantrum of desire and ambition that is to come. The Bad Seeds, accordingly, sit back through the first verse, staying in the pocket but playing like they think they might be able to talk their way out of it. Warren Ellis coaxes a few dour notes out of his violin just as this thing begins to putter upwards, just enough of a counterpoint to let you know that this trip will not be without its tragedies. Cave is typically at his best when he’s at his loosest. Picture him jive-walking through his library, as he seems to do in “We Call Upon the Author,” from Dig, Lazarus, Dig!! !, tossing out his opinions on the volumes therein. But hear him here strangle out the names of his artistic heretofores: Nabokov, St. John of the Cross, Johnny Thunders. Leaving aside that this is a hall of hagiography only Cave could curate, it’s strange and thrilling to hear him moan about the various ailings–some self-imposed, some not–that could have kept them from their art, the unspoken implication that he himself has nothing, is nothing, himself. Flummoxed, crosseyed and frustrated, he and the Seeds explode into a massive chorus. It’s not clear whose beautiful world we’re talking about here, or, for that matter, where it’s going. Is he extolling the world as it is–look at my baby, there she goes–or is he lamenting it as it spins out of control? Every time the chorus comes back, the answer seems to have shifted. And then they all begin to power down, and things begin to get truly complicated. Cave seems to give himself over to the drudge of work (“If you’ve got a field that won’t yield, well, get up and hoe it”), demolishing the myth of inspiration. He cuts against his own petitions, dismisses the muse from her duties. But the song has its own logic by now, its own momentum, and the chorus has to come back again; as though suffused with and overwhelmed by the song’s natural realization and the unnamed hand that guides it, he flips and begs for anything, for the pleasure of peeling grapes to feed it. The band come unleashed, swollen with the song’s gathered power, and Cave’s voice, backed by the choir, sounds like it’s come unclenched. That beautiful world–there she goes–is the song itself. Really nice write-up. As a younger Cave fan, I can say that this is without a doubt the single performance that sold me, sending me out to buy my first Cave album. I admit I don’t enjoy pre-Ellis Bad Seeds’ work as much though, I wonder if any others have had similar reactions? This comment may seem like sour grapes, but it’s not. It’s entirely practical: The blog posts here are getting too long. I might as well go read Pitchfork reviews. When reading these things becomes a chore, I think you guys are in trouble. Birthday Party, Bad Seeds and beyond, Cave is the man. Love this album and this track….thanks for the reminder. 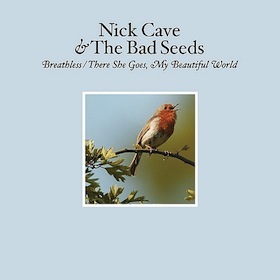 It’s not too long, no Nick Cave song (or anything written with such devotion, as in the music this site writes about) should be treated in a cursory manner. If you think it’s long, get over it. Twitter posts done got to your head. Glad all is well at AD, Justin. I love the site and look forward to reading it every day. I applaud the passion that went into this piece. I’m just saying that it lost me after the first few paragraphs. No worries; one man’s opinion. Best wishes, -s.d. Really nice piece on a really great song – I never get tired of this one for reasons you have articulated better than I could. I push this tune on everyone, going to have to send this link out to prove I’m right! I, like you, found Nick Cave with this song. It started an addiction I’ve never been able to shake. Nick now is my meth. This review wonderfully expressed my feelings for this masterpiece of a song. The two disc album is just superb. Each disc is the antithesis of each other. Nick Cave is a genius prose writer. This review suitably does him justice. Now to see him live on his European tour.